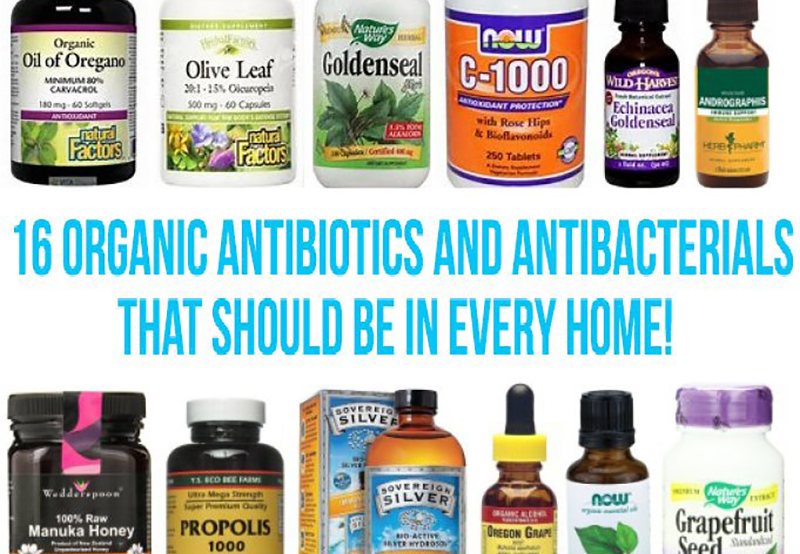 16 Organic Antibiotics And Antibacterials That Should Be In Every Home! Having some organic antibiotics on hand is always good, especially when things get messier. Check the following video to learn more about the top 5 natural antibiotics and their benefits. It is one of the most powerful herbal antibiotics and it is extremely potent. A pound of oregano oil is made from 1,000 pounds of oregano. According to research: Oregano oil was tested in vitro on staphylococcus at Georgetown University Medical Center. Researchers found that even a small amount can provide the same effect as conventional antibiotics. A study published in a popular journal of medicine found that oregano oil has strong antibacterial properties against 5 species of dangerous bacteria, especially Escherichia. Oregano oil contains two active compounds -- thymol and caravacrol. According to Dr Axe, carvacrol is able to treat and reduce bacterial and fungal infections, parasites, viruses, inflammation, candida, and even tumors. Many experts recommend administration of oregano oil for only 2-4 weeks at a time. Some recommend taking it in a pill form, as it has strong nature. Gaia brand is amazing. Oregano oil is also considered as an antifungal and antiviral. Olive leaves are commonly used as a herbal antibiotic alternative. According to research: Even though some studies have shown that the leaves cannot be used as a broad spectrum antibiotic alternative, they are sure effective against dangerous stomach bacteria and MRSA, which is considered as an antiobiotic resistant bacteria. Olive leaves have strong antiviral and antifungal properties. Garlic is rich in antioxidants. Allicin is one of the most potent active component of garlic, and it is found in freshly crushed or minced garlic. Garlic provides strong beneficial effect due to the synergy of its compounds, and even aged garlic provides promising benefits. According to research: Studies have confirmed its antimicrobial properties. A study revealed that garlic enhances the action of gentamicin, and antibiotic, and it even negated its damaging effect on kidneys. Another study has shown that garlic helps in treating common cold, and researchers at the University of Maryland say that it also strengthens the immune system. Garlic has strong antifungal and antiviral properties. It is an astringent herb and it is commonly used in the treatment of infections of the mucus membranes. Goldenseal is also used in the treatment of inflammations. It contains antimicrobial alkaloids, and berberine is the main alkaloid. Goldenseal stops bacteria from adhering to tissues. It is considered as a strong antifungal and antidiarrheal, and it is efficient in the treatment of protozoa. According to research: Researchers at the University of NY have confirmed its efficacy against MRSA. Another study conducted at the Egyps Agricultural Center involved fish infected with bacteria. Some of the fish received antibiotics, and others were given goldenseal. The first group has a 84% recovery rate, and the second group showed a 87% recovery rate.